Muslims in America are bracing for a wave of anti-Islam mobs outside of their mosques on October 9 and 10. American bigots of various social backgrounds plan to utilize their Second Amendment right and arm themselves with deadly weapons in places where Muslims pray across the U.S.. This provocation, called “Global Rally For Humanity,” is a blatant act of intimidation and unquestionably antithetical to the American values of religious pluralism and civil rights. Ironically, the protestors in these mobs self-describe themselves as “American patriots.” This form of identification is not only delusional, but it is disrespectful to the Muslim citizens serving in the U.S. military. Muslims have played – and continue to play – an integral part in defending the homeland and fighting for the American government’s geopolitical interests. Muslims served in the U.S. military under the command of General George Washington, who was Commander in Chief of the Continental Army during the American War for Independence. Rosters of soldiers serving in Washington’s Army lists names like Bampett Muhammad, who fought for the Virginia Line between the years 1775 and 1783. Another one of Washington’s soldiers, Yusuf Ben Ali, was a North African Arab who worked as an aide to General Thomas Sumter of South Carolina. Peter Buckminster, who fought in Boston, is perhaps Washington’s most distinguished Muslim American soldier. Buckminster fired the gun that killed British Major General John Pitcairn at the Battle of Bunker Hill. Years after this famous battle, Peter changed his last name to “Salaam,” the Arabic word meaning “peace.” Peter Salaam later reenlisted in the Continental Army to serve in the Battle of Saratoga and the Battle of Stony Point. If Washington had a problem with Muslims serving in his Army, he would not have allowed Muhammad, Ali and Salaam to represent and serve non-Muslim Americans. By giving these Muslims the honor of serving America, Washington made it clear that a person did not have to be of a certain religion or have a particular ethnic background to be an American patriot. According to Precious Rasheeda Muhammad, an independent scholar, Muslims played historic roles during the Civil War, a turning point in American history. Muhammad’s research “lays to rest the false notion that Muslims made no contributions to our nation’s development.” Nicholas Said, a Muslim American soldier born in Africa, served in the Union Army and became a political and civic activist after the Civil War. Rasheeda notes that Said “had an intellect so profound that an 1867 Nation article described him as worthy of at least the position of vice president of the United States.” A Muslim American soldier like Said was following the Qur’an, which calls on Muslims to defend their communities and respect the law. If he were alive today, Said would challenge those critics who see Islam and American values as incompatible. As they had done during the Civil War, Muslim Americans fought and died in World War II and Vietnam. Over 15,000 Arab Americans, some of whom were Muslim, fought for the U.S. in North Africa, Europe and Asia during the second World War. Historian Edward E. Curtis states that at least twelve Muslim Americans sacrificed their lives during the Vietnam War. Curtis adds that these Muslim soldiers “held military grades from private first class to sergeant.” These facts highlight that Muslims have been involved in the preeminent patriotic struggles of America in the 18th, 19th, and 20th centuries. One of Washington’s most inspiring letters was addressed to the Hebrew Congregation of Rhode Island in 1783. Washington told these early Jewish Americans that he hoped that “the children of the stock of Abraham, who dwell in this land, [would] continue to merit and enjoy the goodwill of their inhabitants,” which insinuates that Washington would sympathize with Islam as well because Islam also holds Abraham in high esteem for founding the monotheistic tradition. In reaching out to the early Jewish American community, Washington makes the point that the more vulnerable religious groups in American society would be protected and safeguarded under the freedoms granted by the Constitution of the United States of America. Now think about the following question: Whose side would George Washington be on: the Muslim citizens serving in the U.S. military, or the mob of bigots who threaten American citizens with violence at their place of worship? I am not involve with picking some sides between anti-Muslims or pro-Muslims. The picture from the top were the patriots who were against the corrupted government in our country which trying to steal their land. 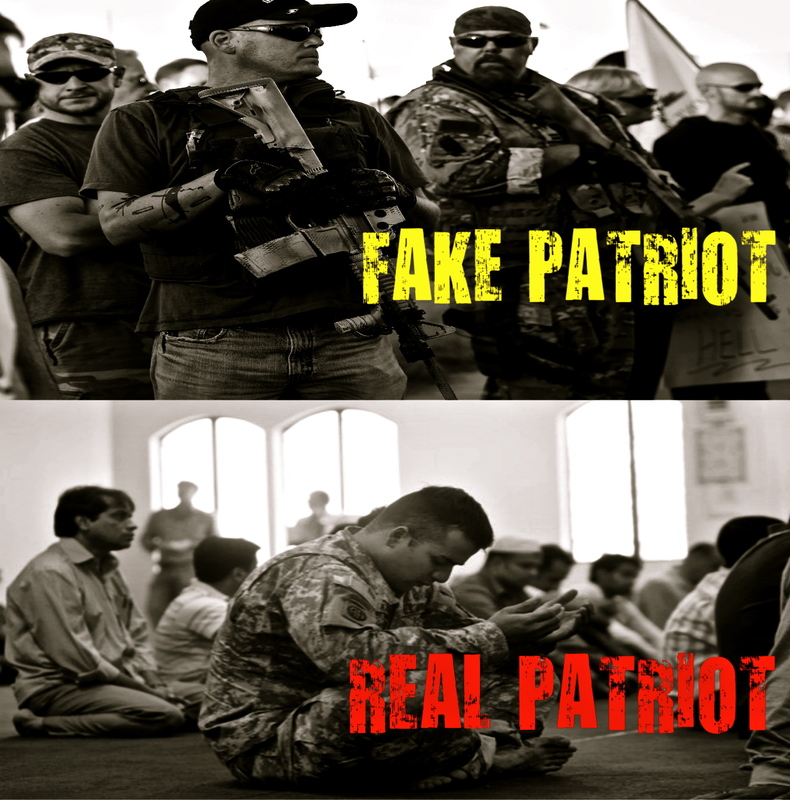 The picture from the bottom was a soldier which labeled so called, “Real Patriot” was a pawn soldier, not a patriot. Beside, most of the right wing socialist conservatives and liberals left wing DID fall into this category. Did you know that our own satanist corrupted government made ISIS? That’s why they send their boot to murder innocent foreign people.